☆ Application: Children' s Room,Hallway, Bedroom,Bathroom,Living Room,Outdoor, etc. 1. Charge the night lamp fully via the USB cable before first use. 2. Press the power button to turn it on with white light, press again switch to 7 -color changing mode, then double press switch to single color mode. 3. Long press the button 5 seconds to turn it off. 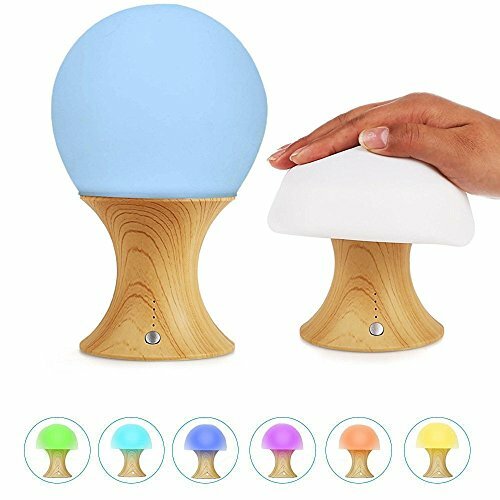 Multicolor Light: Press the button to switch among warm white light mode, 7-color breathing light mode and standby mode, provides a fantastic ambient light. It is bright enough to see where you are going, but not so bright it bothers anyone while they are sleeping. Timer Mode: Double click the button to set timer of 10mins, 30mins and 60mins. Press the button for 5 seconds to turn off the light immediately. Its easy to create a relaxing sleeping environment, and this is a great power saving tool. Long work time:Built-in 1200mA rechargeable battery could work for 7.5 to 17 hours based on different colors, with total working time over 10000 hours. Circuit protection of battery overload, leakage and overcharge makes it super safe. Safety: Made with BPA-Free Soft Silicone material. Sensory experience with it as well. with no dangerous/sharp edges, and it doesn't get hot, so it won't burn little ones hands. Amazing gift for children of all ages, for any occasion. Can also be used for adults who have trouble falling asleep or to relax after a day of hard work. If you have any questions about this product by WoneNice, contact us by completing and submitting the form below. If you are looking for a specif part number, please include it with your message.